lender and offers installment loans. Jora Credit Holdings, LLC was founded in 2017 and has its headquarters in Irving, Texas. The company gives out loans to anyone residing within the states they operate in and who meet their requirements. They operate and function under the rules that apply to the states they serve. The company provides those it serves three services categorized into two distinct groups. Two of these are credit products while the last is a free educational product that helps you improve your financial situation. The details of each of these products are given below, but they are not available to everyone in every state as they do not operate in all 50 states. The states of their operation are also given below. The loan amount ranges from $500 and $2600 and varies from state to state. The specific amount that applies to you as an individual in your state can be obtained on the loan cost and terms page of their website. The loan term ranges from 4 to 30 months depending on the state you reside. It means you can pay back within 4 – 30 months based on your agreement upon application. Upon approval, you are funded within one to two business days depending on the time the application was submitted and approved. The total cost of the loan including the interest on the loan can be calculated on the loan cost and terms page on their site, but for the first time customers, the APR typically ranges between 170% to 349%. What the loan will cost you in total is dependent on your state of residence, your loan history or prior credit, and the amount you borrow. Collateral: There is no need to have any security to get approved for the financing as no collateral is required. Eligibility: To apply and be approved you must meet the following criteria. State of Residence: To be considered for the loan you must live in one of the states that Jora Credit operates in. States Serviced: California (CA), Delaware (DE), Idaho (ID), Missouri (MO), New Mexico (NM), North Dakota (ND), South Carolina (SC), Utah (UT), and Wisconsin (WI). Income Source: You need to be employed or have a verified income source. Bank Account: You need to have an active checking account in your name. Age: With an exception for Alabama residents who must be 19 years and above to apply, and in other states, you must be 18 years or above to apply. Email: You are also required to have a functional email address. Jora Credit verifies all the information provided in the application and they are also subject to your loan history and acceptable prior credit. In some cases, you will be asked to provide additional information regarding your bank account for eligibility verification. Application Method: Once you meet the requirements above you can apply online through their website on your phone, tablet or PC. You only need to complete a 4 step application form. This is another type of credit that Jora Credit offers but unlike the installment loan where the borrower’s account is fully funded with the amount, in a line of credit, once approved, the borrower can access any portion of the credit approved, up to a maximum of the amount approved. The line of credit is more flexible and generally more suitable for people with varying borrowing needs compared to the installment loan. The interest on a line of credit is dynamic in the sense that any amount on the loan you do not withdraw does not incur interest. The rates are fixed and depend on your state of residence, but you only pay the interest on the amount you withdraw. Like in the case of installment loans, Jora Credit has a calculator to help you figure in advance what the loan will cost you throughout its lifetime. Similarly, you can use the calculator to figure out what the line of credit will cost you. This information can be found on the “what it costs” page. Eligibility: Eligibility for a line of credit is basically the same as for the installment loans. Jora Credit will not charge you any non-sufficient funds (NSF) fees, late fees, or prepayment penalties but in the cases of late payments or where you fail to make an amount you will incur additional interests and may also incur extra finance charges. 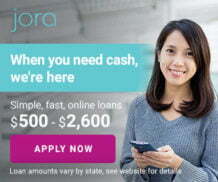 Jora Credit clearly states on their website that the loans they offer are expensive forms of credit and want the borrowers should make an informed decision about whether the financing is a right option for them. This, of course, is due to the fact that the APRs on the loans are high. For First-time borrowers, the loan amounts are usually between $500 and $2,600 and the APRs range from 170% to 349%. For an example of what this translates to in monetary terms, using an example calculation on their website, in Missouri, if you got a $2,000 installment loan, you would be required to pay $179.54 bi-weekly for two years. With an APR of 230%, this means $6,618.50 of interests. This is a total of 48 installments after which the loan will be paid in full. The total cost of credit also depends on the state you reside in, the loan amount you borrow, your prior credit or loan history. For Installment Loans, excluding on bank holidays, if your loan agreement is signed and submitted before 10:30 am Central Time on Monday through Friday, you will get funded on the same day of approval. If your loan is signed and submitted after 10:30 am your loan will be funded on the next business day. This is for loans that are to be funded electronically. For loans that are to be financed by paper check, it can take between 7 to 10 business days as the check will be sent by mail. For Lines of Credit, excluding on bank holidays, if your Cash Advance request is submitted before 10:30 am Central Time on Monday through Friday, you will get funded on the same day of approval and should have your funds in your account by 5 pm your local time. However, if you do not see the funds in your account, you need to get in touch with your bank to check when the funds will be available for use. If your loan agreement is signed and submitted after 10:30 am you will be funded on the next business day. This is for loans that are to be funded electronically. For loans that are made by paper check, it can take between 7 to 10 business days as they are sent by mail. Jora Credit does consider your prior credit and loan history and also verifies the information submitted in the application. But this may not be a limitation as there are no minimum credit scores requirements, because they also consider other factors in determining whether you are eligible for a loan. In some cases, JoraCredit will also ask you to verify the details of your banking account that you provide them. Every detail supplied to them is secure. This is an educational product from Jora Credit; it has been created to enable you to improve your financial situation. The product gives you access to resources and tools that will allow you to find a job, maximize your current career and increase your income on the side. A salary calculator that enables you to see where you stand when your salary is compared with that of others in similar positions. A supplemental income tool that enables you to find other income opportunities using resources and skills you most likely already have. A career path tool to help you visually plan your next career moves by showing you possible career paths. A job search/listing tool from indeed.com. This helps you find opportunities in your line of work or industry and also enables you to see what other available jobs may be of interest to you. Safety 256-Bit SSL Verified by GoDaddy.com, Inc.
State Licensed State Licensed Lender, Regulated by the State Laws. Loan Amount $500 to $2,600*. APR APR’s ranges between 186% and 349%, and may vary depending on the state and loan duration. Loan Period Up to 24 months.